Sometimes counter clutter and a messy bathroom can feel like it’s taking over your life, and it’s pretty much the worst. Even when you have ample drawers and cabinets, things don’t always make it back to their original home. I can admit that I’m guilty of this almost every day, even though my bathroom is freaking huge. Like, am I just that lazy or what?! Although I may not have been born with a ton of organizational skills, I do know that I function/feel so much better when I am more organized. Katrina got my bathroom looking sooo amazing, and more than that, she pretty much blew my mind when it came to functionality. I was apparently making things much harder for myself than it needed to be, and this is likely why I had a hard time actually putting things away. So not only is she an organizing genius, but she’s also helped me keep things looking (close) to this. Here’s what she taught me + what we did. It will make the world of a difference when it comes to feeling organized AND will motivate you to keep it that way! Pay attention to the things that you tend to leave out and brainstorm alternative options for storing them so you’re more inclined to put things back. Maybe you’re not putting it away because the drawer you’re keeping it in is a mess anyway (hand raised high for me!)? Maybe the stuff you use everyday is in the bottom drawer?! When everything is out on the counter, it’s hard to focus visually and be effective with a morning routine. Since my bathroom surface has been clutter free, I find myself remembering to use new and old products more frequently than I used to, now that I’m not getting distracted by the mess! Katrina made me feel confident in putting away the rest by category into my drawers. Now I have sections for facial masks, night creams, new products to try and hair products. And if you really want some stuff out in plain sight, use a tray for everyday products! This actually makes your bathroom look cute, and instead of just leaving stuff out randomly, these items have a home. Y’all, it’s amazing what a few containers in a drawer or on a shelf can do for your life. So much better than everything just floating around in a drawer or whatever. The ones we used are from the Container Store, but you can also use simple solutions that you probably already have around the house. Brushes in cups – we used these simple ones from the Container Store just to keep all of my makeup brushes in one place and where I could see them all for easy use! Bins for stacking eyeshadow palette – To be honest, I rarely wear eyeshadow. One day (!!) I plan to binge watch a bunch of youtube videos and get my eyeshadow game strong, but until that day comes I’ve just got a ton of palettes that need organizing! As a blogger, I get a lot of products gifted to me but I know that most people have at least 2-3 palettes in their collection right? If so, maybe you can incorporate this little storage solution trick into your own makeup drawer? I used these pantry bins from the container store and they worked great! I put all my eyeliners and lip liners (etc.) into little plastic pencil cups so they’d all be standing and easy to access! And these lipstick holders to keep all my shades organized. I used these little kitchen drawer organizers for my lip glosses! Separators or little plastic bins for eyeshadows, lip glosses, mascaras etc. Hair Products – Keep a separate *station* (or bin) for your everyday hair products. You can easily pull this bin (or drawer like in my case!) out in the morning and put it back without cluttering up your drawers with loose product. You can put this basket under your sink or in under a vanity. Use a ring clip for hair bands or a paper clip holder for safety pins and bobby pins. And actually wrap up the cords of your blow dryer, etc. – it’ll save you a mess! We used another one of those pantry bins for my brushes – the key was just narrowing them down and getting rid of the excess ones I wasn’t using! You want to be minimal here because it will make it easier to keep it tidy! For my ponytail holders and bobbipins, I actually used containers that are meant for sugars in your coffee station – they worked great! And for my velcro rollers, I used the MadeSmart 3×6 Kitchen Drawer Organizers and they worked perfectly! If you’re looking for some good velcro rollers, I would recommend purchasing this set by DryBar, it comes with 3 large-sized (same as my hot pink ones) and 3 smaller-sized ones – which is exactly what you need! And while you’re at it, get the matching hair clips too to section your hair while blow-drying! Lately, I have been using the Beachwaver 1 inch curling wand and have been loving it (it’s the one pictured above!). And for my blowdryer, I’m obsessed with the Drybar Buttercup (the regular sized one – I don’t love the travel one as much; it’s not as strong for me?). And then I use both sizes of the DryBar round brushes! I’ll do another post on how I use all these products to do my hair – but that’s not really for this post – back to organizing! And then I used tall containers to organize all my hair products! I used these ones from The Container Store. Bins for themes – Katrina taught me to organize my bins by themes. It seems like common sense, but for some reason I was just kinda throwing things into whatever drawer or whatever bin, with little organization. Now, I have a bin for self-care type items like bath salts, face masks, etc., a bin for all things medicine and sun screen, and so on. In the drawers in the image above, I’ve got different “themes” for my products. Since I have so many different products I want to TRY, I’ve organized them by theme and in a way that I can see them all. I’ve got all my foundations in one spot, concealers in another, lip products in one area, and so on. Obviously, that’s not very realistic or practical if **trying products**isn’t part of your job, the the concept can be applied to any bathroom. 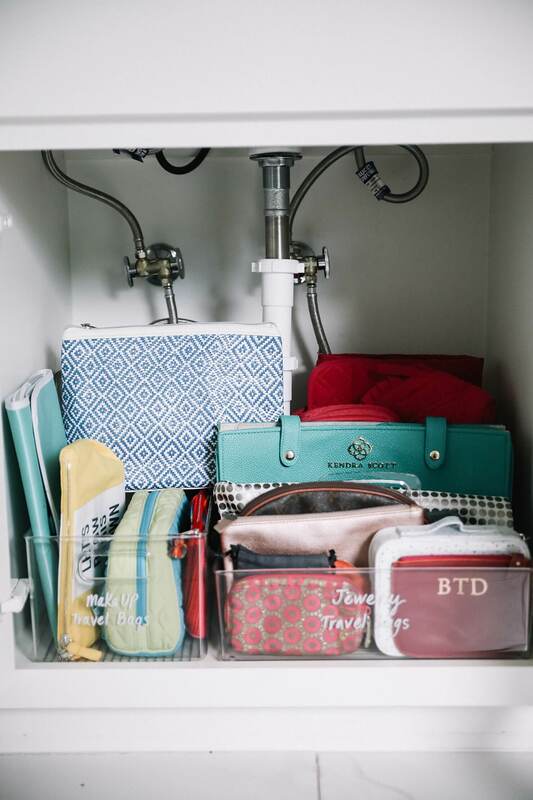 I think the trick is just making sure that you set aside your EVERYDAY products and then have everything else organized by theme for ease of use (and visibility too!). Organizing Everyday Product – Use jars for things such as q-tips, cotton balls, brushes etc. We bought a set of three containers for me to keep by my sink and put my Q-tips, cotton balls and nail clippers in! Label as much as possible – Use stickers to label when makeup or other products were purchased. That way you will know that when you bought it and how much longer you have until they expire. Katrina says “Most of us don’t factor in the time to tidy!” and I realized how true this was for me. This is likely why my bathroom looks like hot mess station on the reg. I would know I needed an hour to shower, do my hair and makeup for a quick shoot, but forget to factor in any time to put the items I just used away before I left the house. Now I am building in just 10 extra minutes, and wow, what a game changer. My systems are actually working because I carved out a little time to keep them up! I think this was the hardest part for me. Because I’m not even kidding when I say that I have like 7 curling wands & irons and I believe they all do something different. But here’s the question. Do I actually use all of them on a regular basis? NO. I definitely tend to go through stages of using one and then switch to another but never do I use all of them within a short period of time. So I had to force myself to set aside the ones I use least often so I could have a nice and neat spot for the one I use most often! We also did this exercise of purging with my makeup and travel cosmetic bags and it was painful, but good! I was able to giveaway several and narrow it down majorly! Setting aside your “bulk” or “surplus” stock of products will make a big difference in being able to have a place for everything and keeping things neat and tidy. Find a separate place for all that stuff and keep it set aside somewhere else in your home. I have all mine in plastic drawers in my garage; it’s set aside from my everyday, but still easy enough to go and get if I find myself wanting to try something new or running out of something. If there’s any time that my life becomes a hot mess, it’s when I’m traveling. Rarely do I actually take everyone out of my travel case and place back neatly – it’s just not something I’m great at. So when Katrina told me to buy duplicate times (of the things I can’t live without), I thought it was genius. If you travel often, keep a travel bag full of all of your essentials (everything from travel sized shampoo to your concealer) at all times. That way, you’re not *stealing* from your bathroom’s inventory and you aren’t creating a mess. It’s SOOO easy. And since the last thing I want to do after I travel is unpack, this saves a lot of effort. I have a running list on my phone of travel things I run out of so that I can stock back up after my trip. Same idea for a purse or makeup bag – while you might not need as many products, having 2 of your favorite lipstick, a mini dry shampoo, etc., will help keep both areas organized. Sephora has a ton of great small sized products by their cash registers – I buy most of my travel and purse items there. I did a whole post on my carry-on packing tips and essentials but I sort of want to do a post dedicated totally to my travel beauty essentials – would y’all be interested?! On top of the weekly assessment, it’s smart to go through your products every 6 months or so. Like ALL of your products. See what you haven’t got around to trying or using, and toss or donate. If you’ve had something for more than a year, it’s likely not good anymore, so trash it. This is a good time to check things like nail polish or anything with liquid to see if the consistency has changed. And then we set my bathtub area up really pretty which I wanted to share, but it doesn’t really have much to do with organization haha – just for fun! And then FOR YOUR AMUSEMENT, here are some before photos I took of my hot mess of a bathroom before Katrina came over to help me!